Hazel M. Mitch 94 (our beautiful Mother) of Butler, peacefully passed away surrounded by her loving family at her home on Wednesday, April 10, 2019. 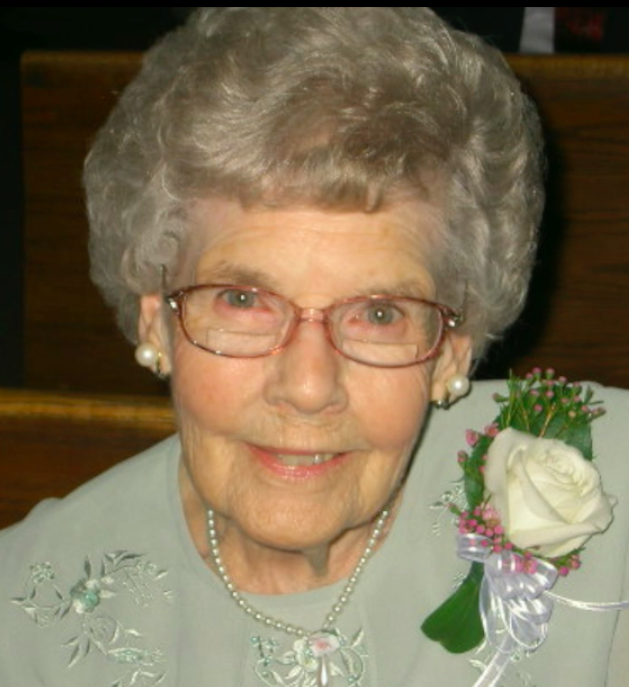 Born June 29, 1924 , she was the daughter of the late Charles and Stella (Gallagher) Stokes. A graduate of Butler High School, Hazel was always proud to say that she never missed a day of school during her 12 yrs of schooling. She was a member of St Mary’s church in Herman and belonged to the Christian Mothers club for many years. Hazel was an excellent baker and her coconut cream pies were enjoyed by many at church functions. She enjoyed doing crafts and especially like doing ceramics. She made endless gifts for family and friends and loved to repaint and repair many of the church statues and Nativity sets. Most of all, Hazel loved being with her family and friends. She hosted many family functions and parties for her grandchildren. Her devotion to Mary and to the Lord were the core of who she was, and rarely was a rosary not seen in her hands. Hazel leaves behind to cherish her memory her children, her daughter in law, Karen Mitch and daughters, Linda (John) Spohn, Corine (Joseph) Pinto, Theresa Heade and Maria (Robert) Leventhal., all of Butler. Her grandchildren, Curtis Mitch, Tawnya Krebs, Vikki Saffran, Monica Donaldson, Bill Mitch, Connie Mitch, Carolyn Hartle, Christina Davansati, Jason Spohn, Gina Folk, Julie Stewart, John Spohn, Joseph Spohn, Aaron Pinto, Dominic Pinto, Frederic Pinto, Anna Heade, Luke Heade, Ben Leventhal and Holland Leventhal and 37 great grandchildren and numerous nieces and nephews. She was preceded in death by the love of her life her husband Frederic Mitch who passed away November 12, 1985 and by her loving son Robert Mitch on November 28, 2016, and also by her siblings Joe Stokes, Mary West, Roy Stokes, Walter Stokes and Dorothy Kundar. A very special thank you to the Visiting Hospice nurses, and Hazel’s caregivers and friends, Velma and Charlene. Friends will be received at the Geibel Funeral Home, 201 East Cunningham Street, Butler, from 2-4 and 6-8 p.m. Sunday. A Mass of Christian Burial will be celebrated on Monday, at 11:00 a.m., at St. Mary of the Assumption Roman Catholic Church in Herman. The Rev. Ward Stakem, Pastor, will officiate. Interment will be in St. Mary's Parish Cemetery. In Lieu of Flowers, Memorial Donations may be made to St. Vincent De Paul Society, 226 Greater Butler Mart, Butler, PA 16001,or to Butler Catholic School, 515 East Locust Street, Butler, PA 16001.